I tucked myself into a corner of the boat, wrapping my arm around a rickety metal rod of some sort. My backpack, stashed with mini bottles of rum, a bathing suit and a first aid kit (you know, everything you need if you are lost at sea) was thrust under my legs and I tried to listen intently to what the strapping guy with the fishing rod was talking about, but as the boat started flying off into the inky water all I could do was stare back at the island of Okinawa, slowly becoming smaller and smaller as the sun began to rise over it’s sleepy terrain. It was majestic! All thoughts of the actual fishing fizzled from my mind as my inner sailor crawled out of the drowsy panic and began drinking in the salty sea spray and delicious, “apparent wind.” That’s a nautical term. Yes, I am being pretentious. Of course I, who am used to the moderate to slow pace of leisure sailing, was overwhelmed by the sheer force at which we were hurtling toward the deep, open water, but as I clambered to the bow of our little vessel and nestled into what would become my spot on deck, looking straight off into the unknown, I began to feel a giddy sense of pride. I was doing something that people dream of their whole lives! I was “living in the cool,” as one of my fellow ex-pats would say. Of course “the cool” became hot as the sun rose in glorious reds, oranges and purples and by the time we had reached our destination, an hour and a half or so out to sea, I was less enchanted and more overwhelmed. I was on a boat in the middle of the ocean with a bunch of people I didn’t know and there was no control I had over the outcome of the next 12 hours. This, you might be realizing, is a bit of a thing for me. One of the many reasons I love sailing is that, more or less, when you don’t count our ironic and devious friend Mother Nature, I control where I go and when and whom I take on board. I had relinquished my control to a barefooted, gap toothed Okinawan man who had skin like leather and was driving the boat with his foot, frequently laughing as some of his “guests” fell down or got sea sick. His name was Mr. Miyagi. I kid you not. I finally gave up the freak out, as it was so exhausting and thoroughly pointless, and settled in to trying to figure out this whole fishing thing. For the last four years….even more…I have had a major bucket list type desire to catch a fish and learn to clean and gut it. So I approached the strapping deck hand with a mini bottle of rum and asked him if he wouldn’t mind teaching me how to go from ocean to kitchen ready…that is, if I caught anything. Chan, as he was known to us, was very happy to oblige and said when we docked, fish I caught or not, he would teach me everything he knew. Chipper, with a goal in mind, I set to figuring out this foreign object called “fishing pole.” It was pretty easy, really. Not the complex art form I had prepared to be crap at after watching movies like “Salmon Fishing in the Yemen” or “A River Runs Through It.” Deep sea fishing, as I learned, is more about sheer stamina and pure muscle….of which I have NONE. No sooner had I cast my first line into the water a tug alerted me that, Oh Lordy, I had me a fish on the hook! And then my arms decided to secede from my body. I couldn’t believe the amount of strength it took to reel this creature in. 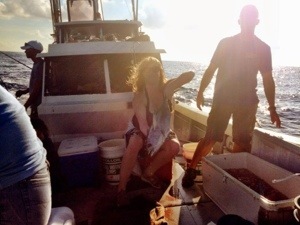 “Chan the Deck Hand” came over and held my pole as I put my whole body into bringing in this still live creature that would soon be on my table! It took me about five minutes but I had finally caught my first fish! A yellowfin tuna. I watched in fascination as Chan slit it’s throat and threw it into a bucket of water that quickly became a bucket of diluted blood. It was incredible! We enjoyed a great, long, sunburn-y day at sea. 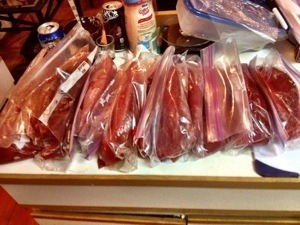 The boat (which was 8 of us) brought in 50+ fish, 6 of which were my very own, huge tunas! The last fish I caught, was perhaps the highlight of the day as I had, at this point, shaking arm muscles and a sunburn forming that would rival a cooked lobster. I was so very hot and so the captain told the deck hand he should shoot me down with some sea water from the pump. This he did. In my face! And just as I was blinded by the salt a yank came on my pole and blindly I put every last ounce of energy I had into reeling that mutha in. The entire boats was laughing and cheering and when the tuna finally plopped down at my feet we realized I had brought in the largest fish of the day!!! Blind. As we turned back toward where shore would eventually be I sat on the bow with my legs hanging off the tip, listening to “The Poxy Boggards” sing dirty sea shanties on my iPod. I was full of salt and sun, stinking of fish and happy as a clam. I started thinking about the whole process of fishing. About Okinawa and the fishing culture that is so integral to their society. I realized that I had spent years on this island, buying fish from the fishermen without really understanding how intense and amazing what they do is. This thought sauntered me on to a realization about how very little I really comprehend about where food comes from. And how if I, a forager in the forest of food amazement, knew as little as I did, then what did people all over the world, who only buy their food at supermarkets even know or understand? 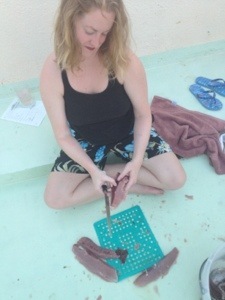 When Chan taught me to clean and gut a fish it bordered on a strange ecstasy for me. The precision, the lines, the anatomy, hell the sheer blood and guts! I was doing something primal. Something people have been doing for thousands of years! Something that the average person, who thinks fish come from the blue styrofoam trays at Safeway, cannot do. I took my loot home and sat on the roof with one of my very own fish. After admiring it’s beauty, the way it’s fins spread, the colors and the life that it had, I made the cuts, I pulled the guts, I removed the bones, I pulled off the skin and I filleted the meat. In that moment, I felt so very accomplished. I felt as if I had climbed Mt. Everest and was looking at the view….except my view was of a life completely changed. 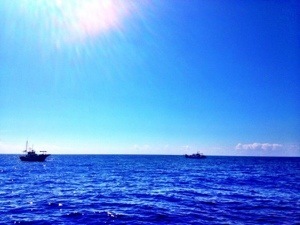 Changed by a fishing trip in the East China Sea. Filets in hand, I slopped down to the kitchen, marinaded, baked, added veggies and greek yoghurt and created the BEST tuna salad I had ever had in my life. 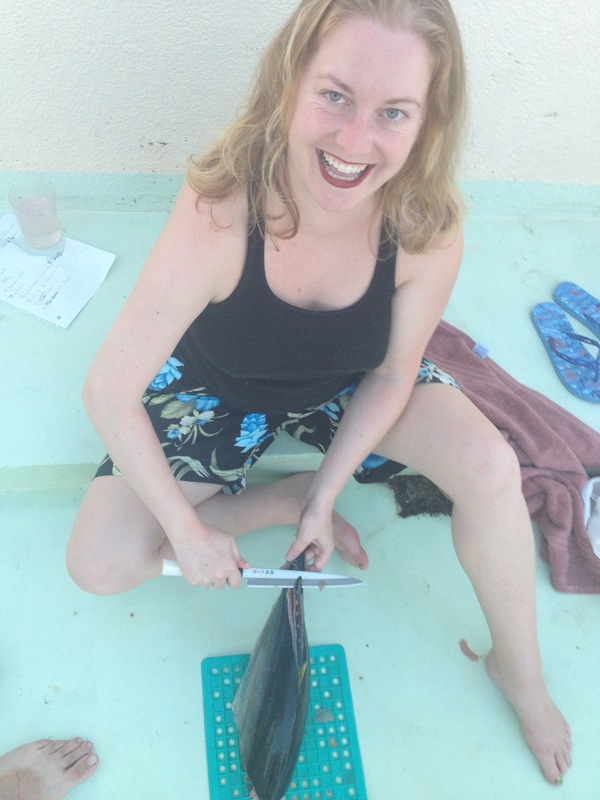 From ocean to plate, I was completely responsible for what was accomplished. It was, without a doubt, sheer Forage heaven! This entry was posted in Deep Sea Fishing, Okinawa, Uncategorized and tagged boating, Chan the deck hand, chartered boats, cleaning and gutting fish, cleaning tuna, cooking fish you caught, cooking fresh fish, Deep Sea fishing, deep sea fishing okinawa, East China Sea, fish, fishing, Fishing in Okinawa, gutting fish, living in the cool, Miyagi fishing boat, ocean to table, Okinawa, Okinawa fishing trips, Okinawa food, sailing. Bookmark the permalink.